AQUASITION - Available for Inspection During the 2017 Palm Beach Boat Show! Currently located in Boca Raton, AQUASITION will be available for inspection during the 2017 Palm Beach International Boat Show, March 23rd – 26th! 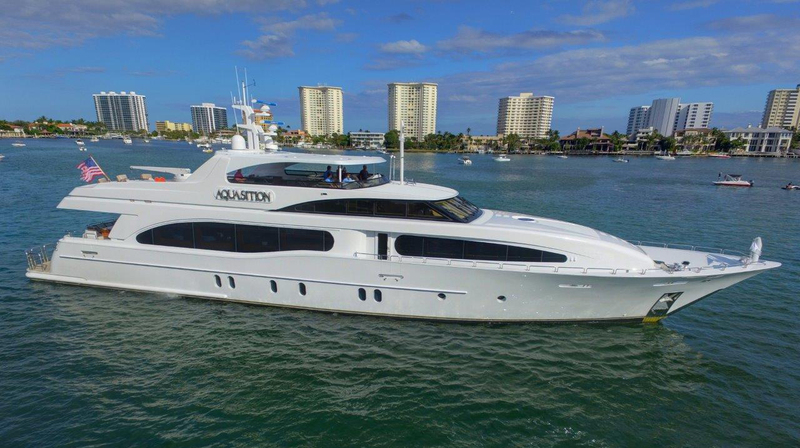 AQUASITION is a highly customized 124′ Motoryacht and is the newest hull built by Broward Marine. She features cherry woods accented by Carpathian elm burl and rosewood throughout. Crown moldings are in contrasting light and dark cherry joinery. This exquisite interior was refit in January 2017, by Architectural Interiors, with new custom salon carpeting, overhead upholstered panels, new furnishings, and new window treatments and soft goods throughout. The vessel accommodates ten guests in five spacious staterooms. She is configured with a large on-deck master stateroom with king berth and private his and her head on the forward main deck. On the lower deck, the spacious VIP stateroom features a king berth with private bath with shower and tub. There are two identical guest cabins with queen berths and a fifth guest stateroom with twin berths. All guest staterooms feature private baths, full entertainment systems and all are well appointed with new soft goods. Her spacious flybridge features a new custom Pipewelders hardtop and was reconfigured with the installation of a new step-up Jacuzzi, and new granite surfaces in January of 2017 along with wet bar and BBQ grill. She is equipped with all the large yacht options to include twin Kohler 65KW generators, Naiad stabilizers, bow thruster, 1,800 GPD watermaker, Asea power convertor, plus much more! All of this in addition to the complete exterior hull paint in 2014, AQUASITION shows exceptional and is truly in ‘as new’ condition! You can also check out her virtual tour here.